A recovery of form at just the right moment saw Kettering Town‘s title challenge get back on track with a victory over main title rivals Stourbridge and today the Poppies host Needham Market at Latimer Park looking to continue their re-found rhythm and consolidate their position at the top of the table. The Poppies hold a 2pt lead over Stourbridge and have two games in-hand. A good start by Kettering on this cold afternoon at Latimer Park with the supporters counting themselves lucky to have a match to watch with so many having been called off around the country. A golden opportunity for Kettering early on as they are awarded a penalty for blatant handball. It’s Holman to take the spot-kick, the goalkeeper goes early leaving a gaping goal but Holman pulls it wide of the target. His second penalty miss of the season and the fourth overall by Kettering. GOAL: The home fans aren’t too disappointed as their team surges forward again and O’Connor should’ve done better as he heads wide of the goal. A ball out to Holman who feeds Stohrer out wide and he plays it across the goal for Aaron O’Connor to slot home. It’s 1-0 to Kettering and they are on their way again. A deserved lead after having several chances and a penalty miss were spurned. Kettering continue to press but another chance spurned with the goal beckoning. At the other end the visitors beginning to push forward and White is left over-exposed by his static defence and has to dive sharply to palm away for a corner that’s scrambled out but another shot comes in that White again puts behind for a corner. This time White collects the cross. GOAL: Needham surge forward again and are having a good spell going into the half-time break. Joseph Marsden is left unmarked and this time leaves White with no chance as he fires straight into the top corner to pull the score back level at 1-1. The second-half gets underway with the pitch cutting up quite visibly as Kettering pick up the tempo to where they were before the visitors equalised. Holman twists and turns and eventually wins a corner. A quick swap as Mills replaces the hobbling Sturgess and Kettering swing in the corner ball from Kelly but it’s scrambled behind for another corner. It’s punched clear and Kettering build again. Cunnington snatches twice at a cross ball but a free-kick is given. Cunnington is being replaced by Hoenes as Kettering hoping to inject more pace into the match. Rowe-turner concedes a free-kick just out wide on the edge of the area. Kettering haven’t been defending well but concede a corner blocking the cross. The ball is played in and it’s headed clear by Kelly. A shot from Mills hits the posts and the rebound is tipped over the crossbar by White for a Needham corner which Kettering clear. GOAL: Kelly-Evans replaces Gary Stohrer. A through ball finds O’Connor who feeds Holman ten yards out but he blasts over the crossbar. Jessup makes a good save from Holman to give Kettering a corner, it’s punched out by the keeper and eventually scrambled clear by Needham. The visitors bring on Kamanzi for Dobson. Great build up play and Holman plays in Aaron O’Connor who side foots into the net. 2-1 to Poppies with 72 minutes gone. GOAL: Aaron O’Connor then makes way for Brett Solkhon for the final 15 minutes after a solid performance coming back from injury. Marcus-Kelly goes into a challenge with Kamanzi and the referee points to the penalty spot. It’s Joseph Marsden again who steps up and slots past White to pull his side back on level terms for the second time this afternoon. Disappointing for the home fans after the mistake by Rowe-Turner led to the soft decision. It’s 2-2 and the penalty miss by Holman is looking a bit costly at this point. Kamanzi, after the penalty dive, goads Richens by obstructing the free-kick but it’s the Poppies player that gets the yellow card. A foul on Hoenes is ignored by the referee in the visitors penalty area as Kettering press to try and get the winner for the third time this afternoon. Time running our at Latimer Park as the crowd hope for another late comeback from Kettering after being pegged back twice. Solkhon slips and Meikle spoons it over the crossbar as Kettering don’t seem to have their shooting boots on this afternoon. Into five minutes of time added on as Kettering desperately press forward and pile pressure on the visitor’s goal. They win a corner, its swung in by Milnes, but eventually scrambled clear. GOAL: The ball is played forward and finds Lindon Meikle who looks up and blasts the ball into the back of the net from a tight-angle. Would you believe it, Kettering have taekn the lead in stoppage time again. Great effort and great strike. Kettering just need to hold on this time and fend of a third comeback to gain a deserved victory. There goes the final whistle to the delight of the home support and Kettering have comeback again late into stoppage time to gain all three points. A deserved victory and fairly solid performance barring a penalty miss and a few wayward strikes as Kettering consolidate their position at the top of the table. Stourbridge went down 1-0 at Lowestoft after they missed two penalties so it was a good day all-round for Kettering. Next up is a tough trip to Redditch Utd next Saturday. Kettering Town: White, Stanley, Kelly, Milnes, Rowe-Turner, Kelly, Richens, O’Connor, Holman, Stohrer, Meikle. Subs: Knowles, Solkhon, Hoenes, Kelly-Evans, Graham. 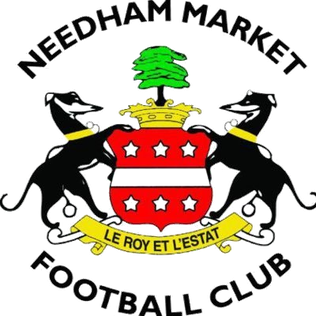 Needham Market: Jessup, Dye, Sturgess, Squire, Baker, Morphew, Ingram, Heath, Griffiths, Dobson, Marsden. Subs: Mills, Cook, Pelling, Kamanzi.